Dino-size Your Passion in 2019! I’m sure you’ve read books and articles about the importance of positive thinking. It is a powerful concept but sometimes it’s difficult to think positively when we feel overwhelmed with our day-to-day problems, not to mention all the problems going on in the world around us. It’s important to understand that whatever we focus on- negative or positive- is what tends to manifest in our lives. When our minds are filled with worry, doubt, and fear, our negative thoughts produce negative energy, which in turn draws more negativity into our lives. When our minds are focused on something positive and exciting, however, our enthusiasm creates a positive energy, which not only improves the quality of our lives but also draws positive people and opportunities to us. Indeed, a positive mental focus not only helps break the cycle of negativity, it initiates a cycle of positivity in our lives. A powerful way to maintain a positive mental focus—to ensure you manifest the best things possible for your life—is by finding and following your PASSION. For more than a decade, I focused on what I felt was missing in my life and, as a result, I felt an overwhelming sense of hopelessness. I did not realize that my negative focus was drawing more negativity into my life and making it virtually impossible for my dreams to unfold. That all changed in 2005, when I inadvertently discovered my passion for dinosaurs and paleontology. My life soon transformed from one of despair and hopelessness to one of excitement and adventure. On the surface, it appeared as though dinosaurs brought me back to life. In reality, it was not dinosaurs that changed my life, but my change in mental focus that broke the cycle of negativity and radically transformed my life for the better. I now realize that every person I know who is happy and lives life to the fullest is, on some level, pursuing his or her passion. 1) It was positive and productive. This one’s quite simple- only something positive has the power to transform your life in a positive way. A negative pursuit (i.e. a harmful vice) will inevitably lead to negative consequences, even if it makes you feel happy when you’re pursuing it. 2) I was genuinely excited about it. There have been times when I have jumped on a friend’s bandwagon because they were “into” something that looked interesting. Those pursuits inevitably fell by the wayside because they were my friend’s “thing” and not mine. Unless you are genuinely excited about your passion, your interest will eventually fizzle and it will not have the power to transform your life for the better. For your passion to help you maintain a positive mental focus and to ensure that you stay on a cycle of positivity, it must be pursued on an ongoing or at least a regular basis. As a teenager and young adult, I had a passion for martial arts and even earned my black belt in taekwondo. In my early twenties, I allowed other things to get in the way and, as a result I stopped practicing and stopped taking lessons. Once taekwondo was no longer an ongoing pursuit of mine, it was no longer able to help me maintain a positive mental focus. 4) I shared it with others. This another simple but very powerful concept. If you are pursuing something you keep to yourself, it is not likely to transform your life, at least in a significant way. It is through the process of getting out there and sharing your enthusiasm that you will make new friends, new opportunities will open, and you will find your passion truly enriching your life. If you are already pursuing a passion that meets the four criteria, then kudos to you! If you’re not, then make 2019 the year you find it. Your true and life-changing passion is like a dinosaur skeleton buried in the ground. You’re not going to find it until you seek it out and uncover it. Once you are “digging” into passion that you are genuinely excited about and share with others on an ongoing basis, then that’s when the positives not only start flowing but will continue to flow in your life! Attorney Elaine Howard transformed her life from one of despair and hopelessness—after battling academic struggles, low self-esteem, and an eating disorder—to one of excitement and adventure when she inadvertently discovered paleontology. 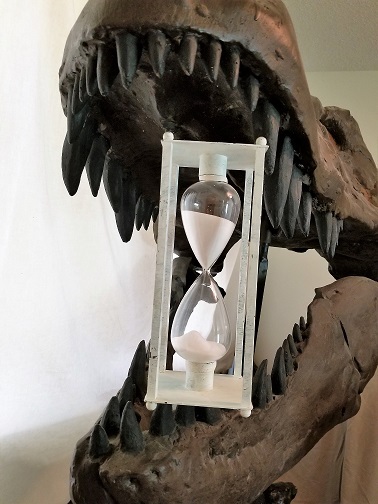 Over the past fourteen years, Howard has become certified in fossil lab and fieldwork by the Wyoming Dinosaur Center and participated in many dinosaur digs. She continues to spend her spare time as an adventurer pursuing her passion for dinosaurs and other prehistoric creatures. As a certified coach and member of the Certified Coaches Alliance, she is also on a mission to encourage others to find their own unique passion and allow it to transform their lives into an exciting adventure. Connect with Elaine Howard on Instagram @dinosaurlaine and visit www.passioninthebones.com. Passion in the Bones: A Guide to Breaking the Chains of Negativity and Living Your Own Adventure is available in paperback and e-book on Amazon and other retailers.